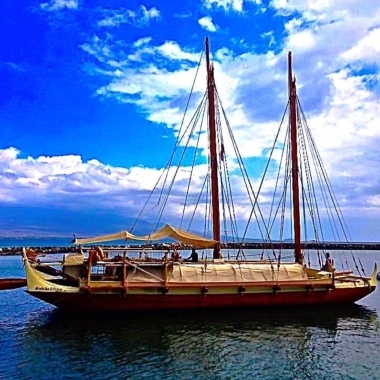 MAUI'S VOYAGING CANOE IN MAALAEA- After months of being in dry dock, without a safe harbor, Maui's first voyaging canoe has a new home at Maalaea Small Boat Harbor. The 62' double hulled Mo'okiha O Pi'ilani was moved Tuesday , the day after it's permanent mooring permit was secured. More than 1000 volunteers helped Hui o Wa'a Kaulua build the canoe in an effort that took more than 18 years. After launching in July of 2014 the canoe was first moored in waters off 525 Front Street in Lahaina. But the West Maui location proved vulnerable to high winds and swells. As part of the search to find a new home, board President Kimokeo Kapahulehua helped create a bill which passed the Legislature to provide moorings for cultural canoes. To complete the documents for a permanent mooring, Kimokeo called on Structural Engineer, Josh Murphree and Steve Madaras of Maui Mooring Service." - Courtesy Maui news April 9, 2016.